This colorful set of four, translucent agate coasters is made in the USA with agate from southern Brazil. Formed when silica-laden groundwater passes through air pockets in cooling lava, agate is a remarkable mineral that was once thought to protect its owners from danger and even produce delightful dreams. These sets are made in the USA with agate from southern Brazil, and while they may not bring you any dreams, they will bring beautiful nature and warmth into your home. Designed by Anna Rabinowicz. Take a studio tour and see where these coasters were designed. A fragment of a shell, a colorful stone, a peculiar gourd—Anna Rabinowicz's creative process often begins with objects found on her trips to Brazil. "These pieces sit on my desk for weeks, sometimes months, while I study them and think about what they might become. Then I begin to sketch and build models; each comes to life as inspiration for a new piece," she says. After studying Industrial Design at the Bezalel Academy in Jerusalem, Anna received her masters degree in Design and Engineering from Stanford University. Her design company explores the use of natural, traditional materials and their juxtaposition with high-tech manufacturing techniques. Visit our blog to take a tour of Anna's studio. Hand wash and handle with extreme care. Very aesthetically pleasing and really enjoyed using these coasters until I made the mistake a placing a cold glass with condensation on one. It left a fuscia stain on my wooden surface. I have a number of marble surfaces that require protection. 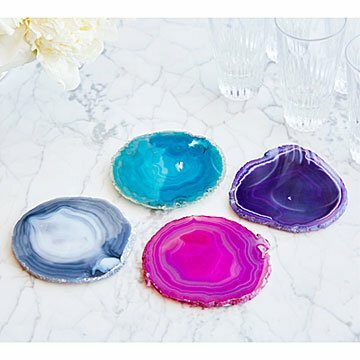 These natural agate coasters look great on white marble. This is such a unique item. I love giving gifts that are "uncommon"! My father-in-law is hard to buy for but loves rocks. He is 80 years old and when he opened them he was brought to tears. A couple are pretty whereas a couple are not as pretty. I think they are a little pricey for what you get and they should be a little thicker for the price that I paid. Definitely adds a splash of color! Gave as gift, but want some for myself! These coasters are just beautiful. The colors are vibrant and I can't say enough about how much they add to a room. My Mom said that she really likes the coasters and that she had set them up on her work desk and coffee table right after opening the gift. I haven't seen the coasters myself but since my Mom is happy then I am happy with the purchase.